My blogging friend, Sherryn, has posted a very good (and brief) description of a word that is being used in many ways today. Is the word over or under-used? I’ll have to think about this question myself. In any case, I think this is a good definition. 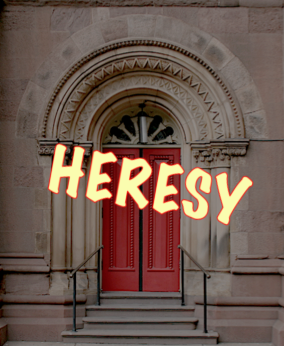 Heresy is a false teaching about the essential doctrines of our faith – the ones we must adhere to, regarding who God is, who Jesus is, salvation by grace, and Jesus’ resurrection. Non-essential beliefs are certainly worth discussing with passion (and love of course), but not to the point where those who hold opposite non-essential beliefs are considered heretical. It is also important to remember that sanctification (our growth in holiness, truth, and wisdom), often is on a different timeline from other brothers and sisters in Christ. This entry was posted on Wednesday, September 28th, 2016 at 7:31 PM and is filed under Uncategorized. You can follow any responses to this entry through the RSS 2.0 feed. You can leave a response, or trackback from your own site.